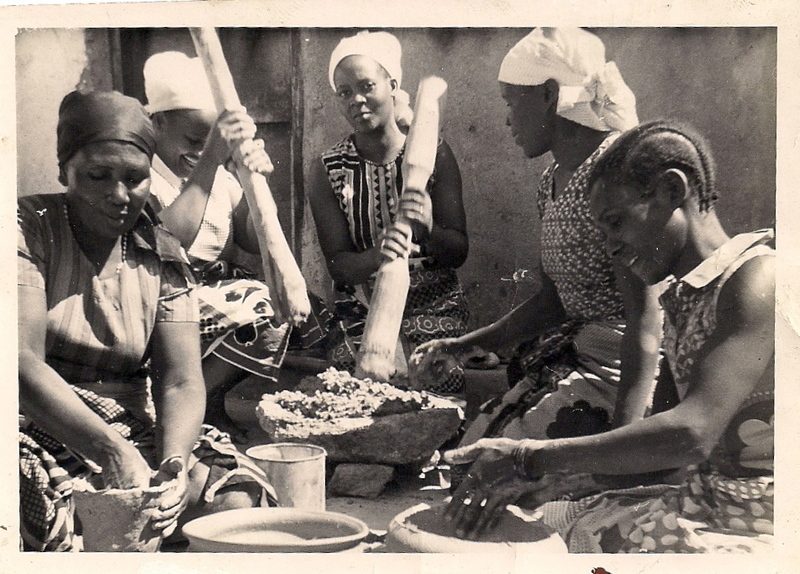 Mama Mwasamwaja teaching a pottery workshop in Morogoro in 1977. I have been meaning to write this for a few months now. It was my intention to post it over Thanksgiving break, a celebration that will always remind me of Mama Mwasamwaja, my African bebe. 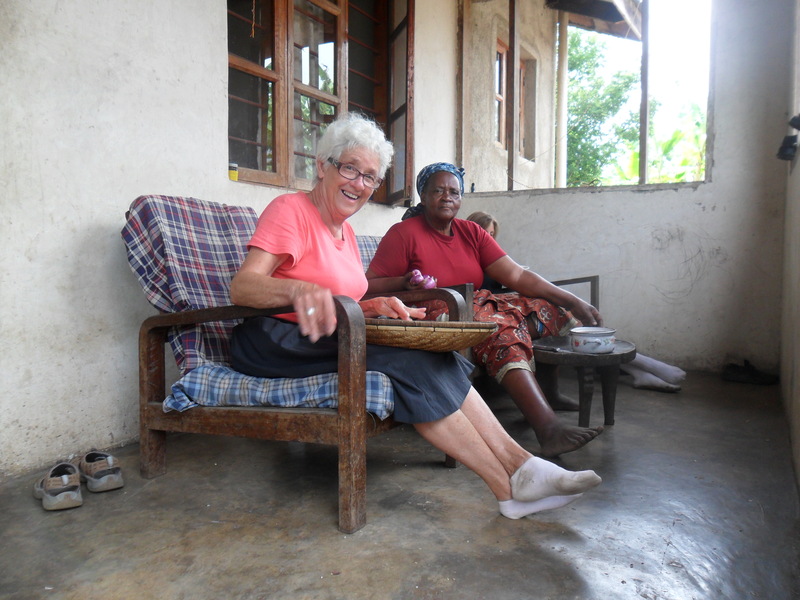 Those of you who read my stories from Manow, Tanzania in 2011 will remember stories about Mama and her vibrant sense of humor. When I told her Katelyn and I had killed the chickens that were being served at Thanksgiving dinner she chuckled and said, “You don’t kill a chicken. You CUT a chicken, you KILL a cow.” I learned of her passing last August, just before moving away from Olympia, WA. 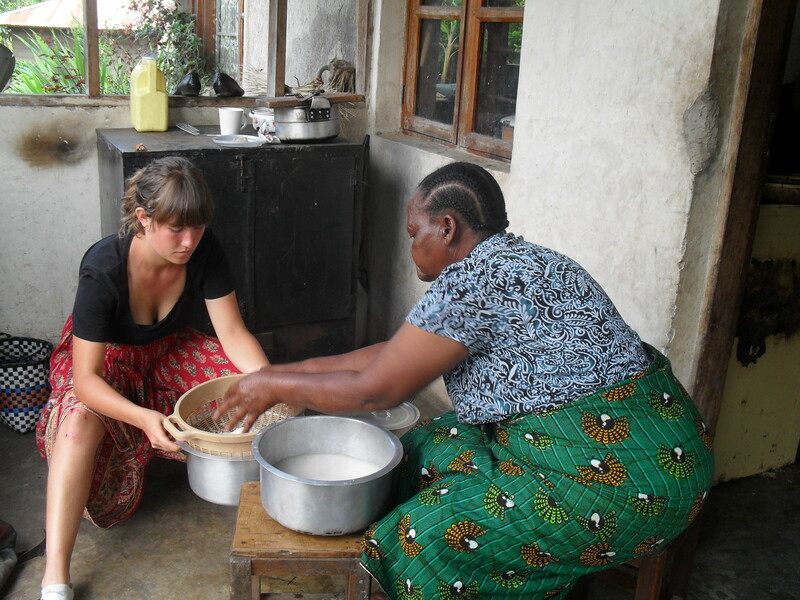 She passed away on August 20 after receiving medical care in Morogoro. It is especially hard to understand the death of a close friend when you have not seen them in some time. In making plans after graduating and after my cousin Darryl began serving in the Peace Corps in Tanzania, I looked forward to visiting Mama Mwasamwaja on her back porch and drinking tea while she taught me a new mkeka pattern. The only comfort I had during my overly dramatic, tearful farewell to the Mwasamwajas in 2011 was that I would see her again someday. Being so far from Manow, I cannot imagine the community with out her laughter or her porch without the piles of reeds she was using to make large woven mats. I’ll never forget when I nervously walked up to her back porch, after frantically buying the first two bunches of brightly colored reeds I saw in Lwangwa. 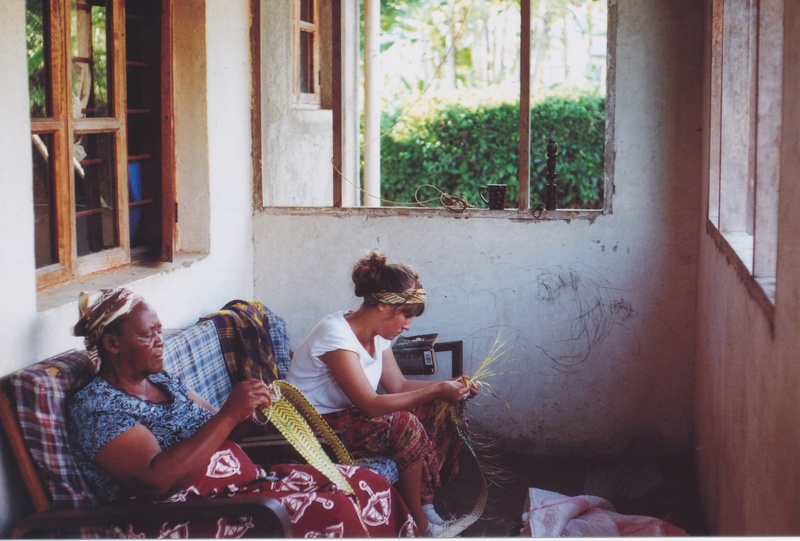 I was determined to learn to weave mkeka and she had promised to teach me. Learning to make pilau, a deliciously spiced rice and meat dish. This was just after I fell on the road in front of her house. Having run out of hydrogen peroxide she dabbed some salt in the bloody scrapes on my palms. She laughed as I howled in pain and told me her own grandchildren know not to come to her when something hurts! I stepped onto her porch timidly and she took the reeds out of my hand and after one brief look told me they were far too dirty, that I hadn’t picked good ones, she would use them for her kitchen mat or something. She sent the girl that worked in the kitchen to find reeds that were of a better quality and thus, our friendship began. For me, she is still there on her porch, greeting visitors on their way to the market in Lwangwa and making rich milk tea in the her new kitchen in the back. 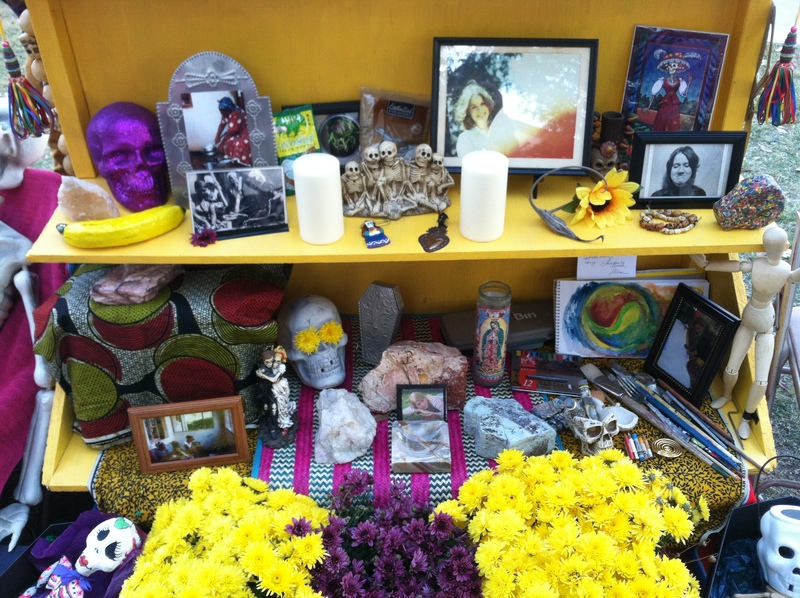 To honor the lives of two of our favorite teachers, Adam and I (with the help of our friend Sherry) set up an altar for Dia de los Muertos in Mesilla, NM after we arrived in the southwest. For Mama Mwasamwaja, I brought a banana, an avocado, the mat she helped me weave, coconut powder, a photo of the peas she gave me from her garden, and a bag of sugar (a common gift given to grieving families in Tanzania after they have lost a loved one). For Lynn, Adam’s mother, he brought her sketchbook, a wooden figure, and her well-used paintbrushes. It was a colorful way to celebrate the memories we have of two incredible women in our lives and to share their lives with other people.